The winter weather didn't cool the job market in February. 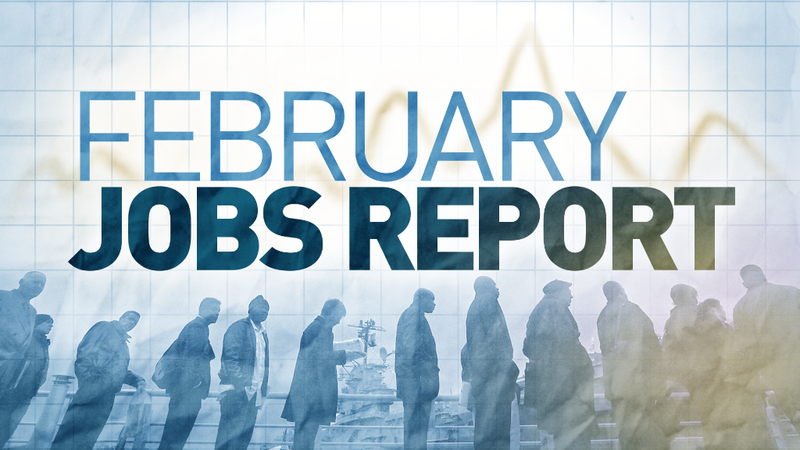 The U.S. economy added 295,000 jobs in February, which crushed expectations. That beat the estimate from CNNMoney's survey of economists, who predicted 235,000 job gains. February's job growth shows how far the economy has come in a year. It's the 12th straight month that the economy has gained over 200,000 jobs, and the unemployment rate fell to 5.5%. That's the lowest unemployment rate since May 2008 -- before the financial crisis. Unemployment has come a long way from a year ago when it was 6.7%. "We have the wind at our back and confidence across so many sectors of our economy," says U.S. Secretary of Labor Tom Perez. What about wages? As more Americans return to work, the question now is when wages will pick up. 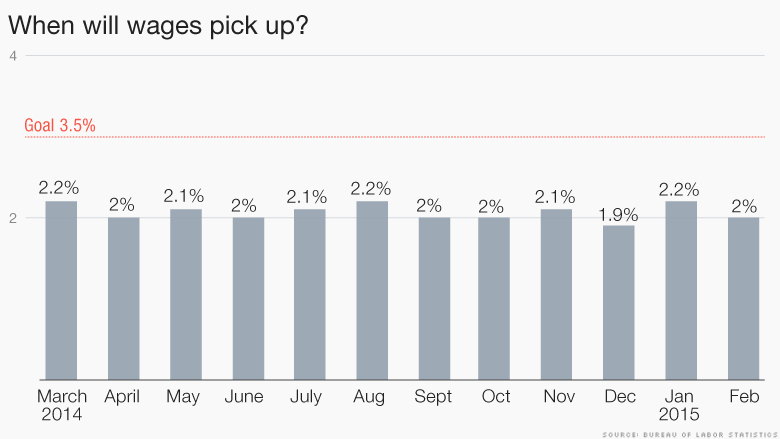 Average weekly wages only rose 2% in February compared to a year ago. In a healthy economy, wages gains are between 3.5% and 4%. The snail-pace wage gains are a key reason why many folks still aren't feeling off better during this recovery. Wages are quickly becoming the focal point for the economy's health. The Federal Reserve wants to see better wage growth before it raises its key interest rate, which will have a big impact on the economy and markets. Friday's report is the last look at the job market before the Fed's policy making committee meets this month. If job growth continues, wages should speed up too, many economists argue. But February's jobs report told the same tale: excellent job gains in recent months with lackluster wage growth. Wages should pick up if the unemployment stays at or below 5.5%, says Jim O'Sullivan, chief U.S. economist at High Frequency Economics, a research firm. "That's still the weak part of the report," O'Sullivan says, but "it's not unreasonable to think at some point in the next year, we're going to get more clear cut wage acceleration." Where the jobs are: Job gains were across the board in many businesses, including retail, health care, and business services. Retail businesses added 32,000 jobs last month, continuing their role as leaders in the jobs recovery. On the downside, retail tends to have a higher concentration of low-wage jobs than other sectors. One warning sign is that energy companies are starting to scale back employment because of low oil prices. Energy jobs fell for a second straight month in February, although the drop was modest. The energy sector has high-paying jobs, and it played a big role in job growth during the recovery. But many economists say falling oil and gas prices are positive the economy overall. The national gas average was as low as $2 a gallon at the start of the year, leading the government to predict American households will save $750 this year on fuel. Still, it unclear whether the energy sector will carry the job growth baton if energy prices don't rebound a bit more. One solution could be health care. 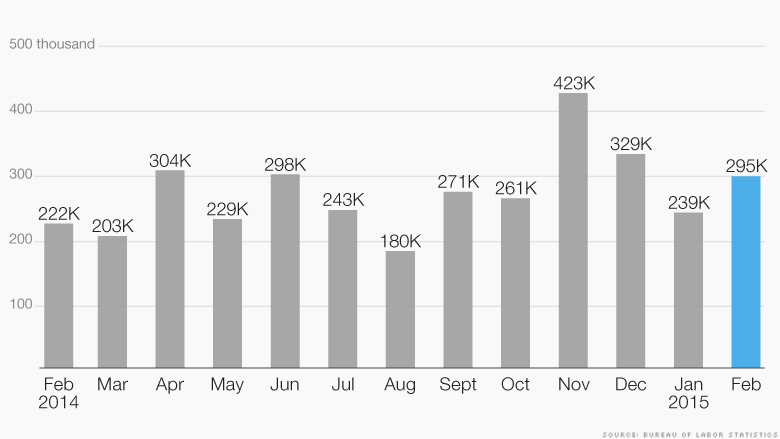 It had another strong month, gaining 24,000 jobs. Obamacare has undoubtedly driven some of that job progress. But there's a jobs caveat to Obamacare: many employers are trying to cut back hours on part-time employees so they don't have to offer them health insurance. Still, the overall takeaway is that February showed strong signs of America's economy heading in the right direction. After years of business owners having an abundance of job applicants to choose from, now they will have to recruit and retain workers, says Frank Friedman, interim CEO at Deloitte. "Now the biggest challenge -- from an economic perspective -- facing U.S. businesses will be retaining their talent," says Friedman.